Who leads the Heisman Trophy race after Week 6? For the first time in a couple of weeks, the frontrunner in the Heisman Trophy race should feel a little heat. Last week LSU running back Leonard Fournette stood atop the Heisman mountain all alone, as other would-be contenders barely threatened him. This week? That’s not quite the case. Yes, Fournette maintained the top spot in our Heisman Watch after the Tigers’ 45-24 victory over South Carolina. But big-time performances by TCU quarterback Trevone Boykin (against Kansas State) and Florida State running back Dalvin Cook (against Miami) reminded voters that legit candidates exist outside Baton Rouge. The second half of the season will be telling for Fournette’s Heisman campaign. LSU has yet to face Florida, Alabama, Ole Miss and Texas A&M. Each one of those teams boasts an imposing defensive front, which means we’ll get a better idea of exactly how dominant Fournette is when it counts. ​Fournette’s streak of 200-yard games ended on Saturday, but the Heisman leader still imposed his will on the South Carolina defense. The sophomore scampered for 158 yards and a touchdown on 20 carries in less than three quarters against the Gamecocks. Fournette’s 83-yard score just after halftime pushed him over the 1,000-yard mark for the season in less than five total games. Fournette’s season total now sits at 1,022 rushing yards, making him the fastest player in SEC history to reach the 1,000-yard mark in a single season. Moreover, only nine other players in FBS history have rushed for 1,000 yards in a season’s first five games. The wild card in Fournette’s Heisman future might be LSU quarterback Brandon Harris. The sophomore had his best game of the year against South Carolina, completing 64 percent of his throws for 228 yards and two touchdowns. If Harris shows more consistency in SEC play, defenses won’t be able to focus on Fournette. That could lead to even bigger performances for the sophomore. Heading into Florida State’s matchup with Miami, Seminoles fans didn’t know if running back Dalvin Cook would suit up at all at Doak Campbell Stadium. He didn't practice earlier in the week due to a strained hamstring. But by the time Florida State put a bow on a 29-24 win over the Hurricanes, any notion that Cook could have a letdown performance seemed silly. The sophomore looked healthier than ever in running for 222 yards and three touchdowns in the ‘Noles victory. Cook became the first Florida State rusher to post two 200-yard games in a season since 1981. In the first quarter alone, Cook scampered for a 72-yard touchdown and hauled in a 36-yard receiving score. Cook’s big game coincided with a strong performance from ‘Noles quarterback Everett Golson. The Notre Dame transfer, who struggled with turnover problems during his final season in South Bend, completed 25 of 33 passes for 291 yards. For a while it seemed like Cook might have to carry Florida State’s offense as Golson worked to find his footing. But on Saturday Cook and Golson looked dangerous as a duo. That could impact Cook’s Heisman candidacy going forward if Golson takes on a bigger role in the ‘Noles offense. Perhaps we should’ve seen the final result of the Red River Shootout coming. The annual matchup between Oklahoma and Texas at the Texas State Fair never seems to stick to the script. This year, the seemingly inept Longhorns stomped on Oklahoma’s potent offense in a 24-17 win. Suddenly Charlie Strong looks like the right man for the job in Austin. But while Texas played the game of its season so far, Sooners quarterback Baker Mayfield couldn’t get his offense moving. Oklahoma punted on five of its six possessions in the first half as the Longhorns built a 14-3 lead at the break. The Sooners’ first trip to the end zone didn’t come until 5:16 remained in the third quarter, when Mayfield hit Dimitri Flowers with a 2-yard touchdown toss. 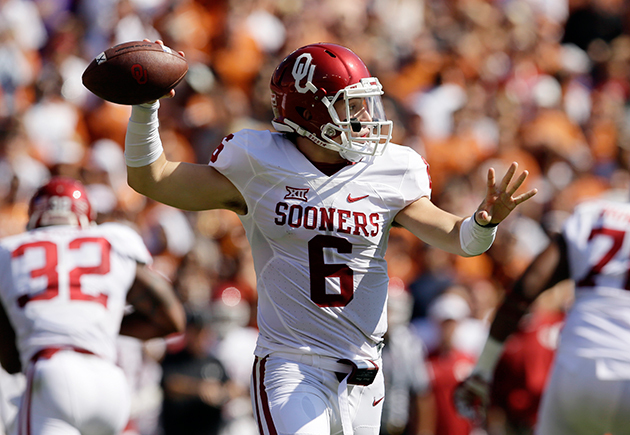 Mayfield didn’t exactly play poorly on Saturday; he completed 20 of 28 passes for 211 yards. But he didn’t do enough on third down to keep Oklahoma on the field in key moments. He also recorded a season-low one touchdown pass. The Sooners are hardly out of the Big 12 picture, which means Mayfield can still rebound while leading an offense that’s been dangerous for most of the year. But he didn’t come through on a big stage this weekend. Florida State’s Dalvin Cook turns on the jets on a 72-yard touchdown run in the first quarter against Miami. Fournette could increase his lead in the Heisman race next weekend. Florida ranks third in the SEC in rushing defense (3.05 yards per carry) and has given up just three rushing touchdowns. Oh, and the Gators come to Death Valley with a 6-0 record. The Mountaineers’ once-stingy defense has given up 77 points in two losses over the past two weeks. So naturally what West Virginia needs is a road trip to Baylor, where Russell leads the FBS in passing efficiency (210.68). Derrick Henry (3.5 yards per carry) and Alabama’s offense weren’t explosive in a 27-14 win over Arkansas on Saturday. But it doesn’t help Henry’s efforts when drives end on Jake Coker interceptions; the quarterback threw two in the first half against the Hogs. If Henry dominates a strong Texas A&M defensive front, he’ll hop right back into the thick of the Heisman race.